Restrictions:Some material is restricted; see box listing for details. Copyright: Copyright for some materials has been transferred to the University of Louisville. Romano L. Mazzoli was born November 2, 1932 in Louisville, Kentucky where he attended Catholic schools. Upon graduation from the University of Notre Dame in 1954, he was drafted into the United States Army, where he served for two years. He then returned to Louisville and graduated from the University of Louisville School of Law. After a brief career practicing law, began his career in politics, running for the Kentucky State Senate from the 35th District in 1967. He served as a State Senator until his election to the United States House of Representatives from the Third Kentucky District in 1970. 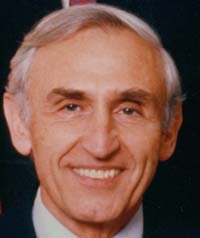 While in the Congress, Mazzoli chaired the Immigration, International Law and Refugees Subcommittee of the House Judiciary Committee for twelve years and was responsible, with Senator Alan Simpson, for the last major immigration legislation enacted in the U.S. to date, the Simpson-Mazzoli Immigration Act or Immigration Reform and Control Act of 1986. 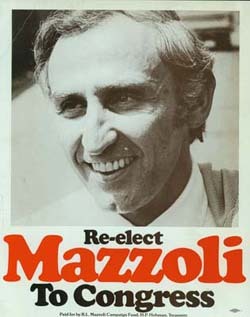 Congressman Mazzoli retired from Congress in January 1995, and returned to Louisville, Kentucky to teach. He also served as a Fellow at the Institute of Politics at Harvard University’s John F. Kennedy School of Government in 2002, and earned a Master’s Degree in Public Administration from the Kennedy School in 2004. He has been married to the former Helen Dillon of Louisville since 1959 and they have two children and four grandchildren. For more information, please see the detailed biography. Note: The collection dates primarily from the mid-1960s through the mid-1990s, when Congressman Mazzoli was in (or seeking) office, although there is earlier material that documents his childhood and family life. Types of materials range from correspondence to campaign material, from records relating to his service on Congressional committees to his work on behalf of individual constituents, and include photographs and audio-visual materials. The collection documents his day to day schedule before, during and after his terms in Congress via 18 linear feet of schedules, calendars, itineraries, and guest books. His literary production, such as articles, speeches, and transcripts from public forums, are also represented in a similar quantity. In addition, records of his campaigns -- from his 1967 campaign for the Kentucky State Senate through his campaigns for each term of office -- make up a total of more than 27 linear feet of materials, including financial records, organizational records, brochures, bumper stickers and letters to voters. The day-to-day operation of a congressional office is documented in general office files. Legislative work represents the largest subset of materials, totaling over 200 linear feet. This series documents all of Congressman Mazzoli’s work in Congress, other than committee work, which by itself totals more than eighty linear feet. The committee records reveal the work within the committee structure of the United States Congress, including his work on immigration reform. The collection also contains files on various issues, subjects and projects, both general and local. General issues are those things that were of concern to people all across the United States, and about which local people often contact their representatives in Washington. Examples include abortion, school busing, the Equal Rights Amendment, tobacco, and Watergate. Local projects are focused on actions and issues specific to the Third District of Kentucky, such as the fate of the Naval Ordnance Station in Louisville, the development of the Louisville Waterfront, Kosmosdale, and the expansion of Standiford Field. Together the records of general and local issues total over one hundred linear feet. In addition, there is a small amount of information relating to local Democratic Party politics, including local Democratic clubs. Thirty-one linear feet of case files chronicle the assistance that Congressman Mazzoli and his staff gave to constituents encountering problems with the federal bureaucracy. These materials are a randomly sampled 10% of the case files originally transferred from the Congressman’s offices. These files, and the files of those nominated for military academies, are restricted due to the personal nature of the contents of many of these files. The nominations to the military academies were also culled, and consist only of those candidates who ultimately attended the academies. The collection includes a substantial amount of correspondence, which is found throughout the papers but concentrated in a series titled "general and personal correspondence" that totals more than fifty linear feet. Correspondence includes invitations and responses, copies of notes sent by the Congressman, and form letters as well as personal correspondence for the period from 1995 to 2000. 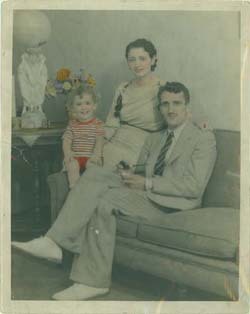 The collection also contains a small amount of documents and photographs covering Mazzoli’s family history and Italian heritage, his family life and other aspects of his pre- and post-political career. In addition, there are fifty linear feet of news clippings, summaries and videos of coverage of Mazzoli. Finally, the papers include twenty-eight linear feet of photographs, both official and otherwise, along with video and audio tapes of interviews and media appearances, including his own "In Congress with Ron Mazzoli" program. Romano L. Mazzoli served in the Kentucky Senate for two years and the United States House of Representatives for twenty-four years, in a political career that began in 1967. This collection documents his personal life as well as his political career. The Romano L. Mazzoli Papers have been divided into fourteen series reflecting Mr. Mazzoli’s family history and personal life, political career, and his pre- and post-Congressional professional activities. Materials came from both the Washington DC office and the 3rd District office in Louisville and are organized together in each series. Each series begins with the files from the Washington office, followed by those from the Louisville office. In some cases only one office or the other held a certain type of files. Other materials came from the Mazzoli home. Due to the nature of Mazzoli’s political career, there is frequent overlap of kinds of materials in different series. There may be correspondence in several series other than Series XI: Correspondence, if the original files were kept in that manner. All of the Congressman’s speeches and writings may not be in Series II: Literary production: campaign speeches can probably be found in the series dealing with the campaigns, and his speeches on the floor of the House of Representatives are mainly in Series V: Legislative work. There could be files in Series VIII: Local Projects that complement those in several other series, such as Legislative Work, Congressional Committee Work, or News Clippings. For the most part, the collection is arranged chronologically within each series, and then again chronologically as Washington office files or Louisville office files. Within this matrix materials are usually in alphabetical order. Romano L. Mazzoli announced his retirement from the United States Congress in early 1994. He then began preparing for the transfer of his personal papers to the University of Louisville Archives and Records Center. This process began in late 1994. The boxes of files came from several locations, including his district office in Louisville or nearby storage, from his Washington DC office, from the National Archives and Records Administration facilities in Suitland, Maryland, and Atlanta, Georgia. In addition, several boxes were brought to the Archives from his home in Louisville. The collection was in storage until the processing could begin in 2007. At that point, boxes were moved from storage in the same order that they had arrived, in shipments of 50 to 80 at a time and processed as they arrived. A project assistant was hired to work 20 hours a week under the supervision of the Project Supervisor. Together they established a processing plan, along with a tentative processing schedule. The plan included leaving papers in original folders whenever possible, and using the same labeling on new folders as the originals. Even with such a plan and tentative schedule, series titles and box numbers could not be assigned until the processing was complete. Plus, there is a great deal of overlap in the types of documents, that most series have material that could have been placed in at least one other, and usually more, series. Fortunately, with student help, we will be able to create a detailed folder listing for this collection. The processing theory of "More Product, Less Process" was applied to some series in the collection, other series required more time. The collection was almost 1500 linear feet when it first arrived. Duplicate items and easily accessible printed material were removed from the collection, along with such items as cancelled checks. Certain files have been restricted for fifty years from creation date as they contain personal or sensitive information. Most of these restrictions are on either Personnel files or case files. For case files and “Readers” or quick notes sent by the Congressman, a 10% random sampling was done to demonstrate the kind of work that was done for constituents in need and how often Mazzoli was in contact with individuals in his district. Military academy nominations were also culled, with retention of only those files of the few young men who actually went to one of the academies. These too are closed as they contain school and medical records among other things. The first series consists of the Congressman’s calendars, schedules, itineraries, appointment and guest books and related paperwork that document his day-to-day activities before, during and after his terms in the United States Congress. They date from 1964 through 2000 and show how his workday progressed in private law practice, as a state senator, as a Congressman in Washington, DC and in the Third District of Kentucky, and as a private citizen. Series II consists of items written by Congressman Mazzoli and include all types of literary output including articles, speeches, press releases from his office, and transcripts from the public forums in which the Congressman participated. Some of his literary output may also be found in other series such campaign speeches (Series III) and speeches given on the floor of Congress (Series V). Series III is made up of all types of campaign files including those from Mazzoli’s successful runs for the Kentucky State Senate and the United States Congress, as well as his unsuccessful run (1967) in the Democratic primary for Louisville mayor. The material ranges from public relations items to financial reports, information by and about volunteer campaign workers to staff people, issue papers, campaign correspondence, plans and issue papers, information about opponents, and election results. This large series contains the general working files from the Congressman’s office in Washington DC, and his Third District office in Louisville, Kentucky, along with some materials from his home offices. Included are files kept by staff members, which are identified as such whenever possible. There are many files from the office of his long-time local chief of staff, Charles Mattingly. There are also office account files and personnel files included in this series and these are restricted from public use for fifty years from the date of the file. For the most part, this series is arranged chronologically, with an alphabetical order within each time period. Series V is by far the largest series in the collection as it documents Congressman Mazzoli’s twelve terms in the United States House of Representatives and all of the legislative work done during those terms (other than committee work). These files contain research, notes and memos, correspondence, and anything else pertaining to his general legislative responsibilities. The files are arranged chronologically, with an alphabetical organization within each time period. Near the end of the series are boxes on specific legislative topics. These are extensive research files on various topics that were covered by bills coming up for a vote. These range from Aid to Parochial Schools and Civil Rights to Transportation and Veterans. There are over thirty linear feet of bills and resolutions filed, sponsored, or co-sponsored by Mazzoli. This series also includes legislative summaries and the Congressman’s official voting record. The records in Series VI deal specifically with the Congressman’s committee work within the United States House of Representatives. Mazzoli served on the House Judiciary Committee and on the House Small Business, Intelligence, Education, and District of Columbia Committees. As co-author of the Simpson-Mazzoli Immigration Act (the Immigration Reform and Control Act of 1986) he was responsible for the last major piece of immigration legislation enacted in the late 20th/early 21st century. The files in this series contain research, correspondence and other documents pertaining to general issues and subjects under consideration by the United States Congress on a national level. These include such controversial topics as abortion, school busing for integration, the Equal Rights Amendment, tobacco, and Watergate and the resignation of President Richard M. Nixon. Files on topics more pertinent to Kentucky’s Third District are found in Series VIII. The subjects of the files in Series VIII are those of particular importance to Congressman Mazzoli’s constituents in the Third District of Kentucky. They contain research, correspondence, official documents, and other materials relating to such topics as the base closures and the fate of the Naval Ordnance Station in Louisville, the development of the Louisville Waterfront, the expansion of the Louisville International Airport at Standiford Field, and the immigration issue as it affected the Commonwealth of Kentucky and specifically the Third District. Many of the boxes contain the files of various staff members which illustrate the time and efforts of the staff in dealing with issues on the local level - serving as the Congressman’s representatives when he could not be present. Case files illustrate much of the work done in the local office of a congressman or senator for individual constituents. These files usually deal with a problem that a constituent is having with a person, agency or program of the federal government. Such issues range from not receiving a social security check or having difficulty getting a passport to more serious matters such as being wrongly imprisoned or needing the assistance of the State Department for a mix-up in a foreign country. The staffs of Representatives and Senators handle literally thousands of these cases and the paperwork is immense. For that reason, this series is a 10% random sampling of the case files originally transferred to the Archives. Due to the personal information contained in these files they are restricted for fifty years from the date on the file. Congressional offices keep a record of the press coverage of their Representative or Senator. This series contains files of news clippings, news summaries, and some audio and video tapes of the work and life of Congressman Mazzoli from both the Washington DC and Louisville offices. These materials illustrate the image of the Congressman’s work as it was portrayed by the local and national press. They are arranged in chronological order. This series is organized first by type of mail and then chronologically. First comes invitations with responses, followed by "Readers," then form letter responses to constituent mail, and general correspondence dating from 1995-2000. About 25% of this series is invitations, another 25% consists of copies of quick notes sent by Mazzoli to others thanking them, offering sympathy, or congratulating them for some achievement. Mazzoli was such a prolific letter writer that only a random sample of 10% of these Readers were preserved. These are followed by form letters (called computer letters) which were personalized and mailed to individuals who wrote in on a particular subject. They are arranged in chronological order, then in alphabetical order by subject. Much of the correspondence is located in the other series, so Series XI contains mainly political and personal correspondence from files that were identified as such and personal correspondence from the years following Congressman Mazzoli's retirement from Congress. Items documenting Romano L. Mazzoli’s family history, personal life, and activities after he retired from Congress are found in Series XII. This includes some photographs and information about his Italian heritage and trips to Italy. Other foreign travel is documented as well. There is material about his father’s interest in playing football with a local group called the Bonnycastle Club dating to the 1920s. This series also contains items from and about Notre Dame (1978-1994) and his time at Harvard, both as a Fellow at the Institute of Politics and as a student at the Kennedy School of Government. This small series contains material related to local Democratic Party activities, particularly the many small neighborhood political clubs common to Louisville. This fairly large series contains different formats of media and is almost evenly divided between photographs and videos. There are extensive files of photographs, some of official and ceremonial events, others in a more casual setting. The videos are made up of interviews, appearances with others on various television news programs and these are arranged in chronological order. There are also several boxes of video tapes from the program "In Congress with Ron Mazzoli." Box 94. Account Reports, 1986-1993, RESTRICTED missing? Box 621. Video tapes "In Congress with Ron Mazzoli"
Box 622. Video tapes "In Congress with Ron Mazzoli"
Box 623. Video tapes "In Congress with Ron Mazzoli"
Box 624. Video tapes "In Congress with Ron Mazzoli"